United Way of Salt Lake provides meaningful opportunities for volunteers in our community schools and with our partners to achieve our mission of lasting social change. Volunteer as a mentor or tutor, help at an event, or host an in-kind donation drive! Join the Volunteer Action Network today! Members of the Volunteer Action Network (VAN) are part of the solution to help children and families succeed! As a VAN member, you receive customized volunteer opportunities and our monthly Volunteer Newsletter. You are also eligible to volunteer as a mentor or tutor, and you have access to leadership opportunities within the volunteer program. Join us! Join our Volunteer Action Network and sign up today to get connected to a reading, mentoring, or tutoring program. Not finding the perfect volunteer opportunity for you? Find more opportunities with other community organizations through Just Serve and Volunteer Match. 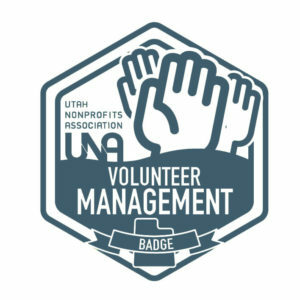 We have achieved the Volunteer Management Badge through Utah Nonprofits Association! United Way of Salt Lake is excited to be one of seven organizations to obtain this badge.